The Green Bay Packers Outdoor Club Seats provide the normal features of NFL Stadium clubs, but are situated entirely outdoors at Lambeau Field. The Lambeau Field seating chart shows the Outdoor Club Seats on the 400 level along the visiting team sideline. Green Bay Packers Outdoor Club Seats are spread throughout the 400 level down the entire length of the visitor’s sideline. Tickets for the Outdoor Club Seats also grant access to the Lambeau Field club level in addition to a specific outdoor seat. Unlike the Indoor Club Seats, the Outdoor Club Seats are not climate-controlled and have only slight protection from the elements. 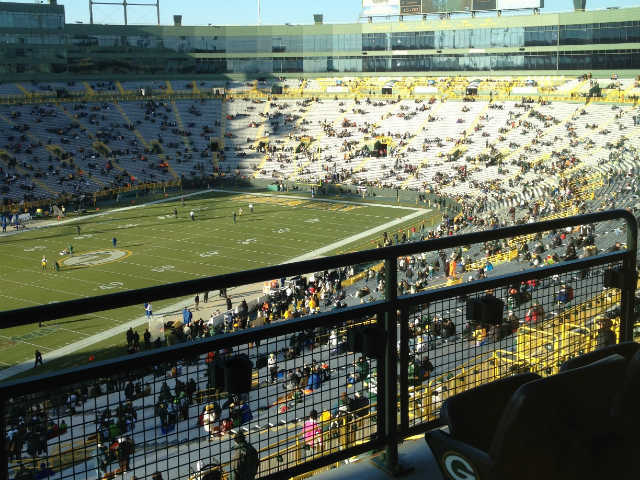 Fans afraid of the Wisconsin winter should avoid the Outdoor Club Seats during cold months. The advantage of the Outdoor Club Seats is that they provide a view far superior to the indoor areas. The elevated height of the 400 level provides good perspective on action occurring anywhere on the field. Packers Outdoor Club Tickets are only sold as full season tickets by the team. The team has a waiting list for season tickets at present. However, since the wait list for season tickets in the club areas is different than the list for regular seats, there is a five-year wait time for club seats compared with a 25+ year wait list for regular seats. Since all Outdoor Club Seats are sold as full season tickets to long-time owners, fans looking for individual game tickets in the seating area cannot purchase tickets from the team. Rather, shoppers should look to third-party Packers ticket vendors and independent ticket brokers for the best inventory for all games.